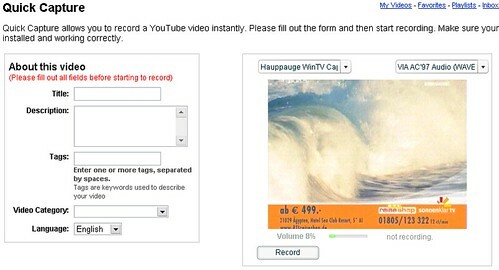 Wie ich mir gestern schon dachte, ist die Quick Capture-Funktion von YouTube neu dazugekommen. Mit diesem kleinen Java-Applet lassen sich Videos direkt im Browser von einer beliebigen an den PC angeschlossenen Videoquelle aufnehmen, was zu 90% natürlich die Webcam sein dürfte. Somit kann ein Video direkt im Browser erstellt und muss nicht mehr hochgeladen werden. Our ads are created and managed under the exact same guidelines, principles, practices and algorithms as the ads of any other advertiser. Likewise, we use the very same tools and account interface.As does any advertiser, we aim to give our campaigns a budget which is in line with their value to us in terms of the increased traffic we might see. We actively monitor and manage the success of our ads by adjusting ad copy, keywords, bids, and so forth in the same way any advertiser who is concerned with their account performance would.